Every great product or brand starts with an idea. But how does an idea grow into a big idea that stops your audience in their tracks? It’s easy to fall into the trap of producing content without a clear idea behind your content strategy. If your organic traffic isn’t growing month over month, or if you find yourself continually spending advertising budget to acquire readers, this probably means that your content strategy lacks a big idea. David Ogilvy was absolutely right. 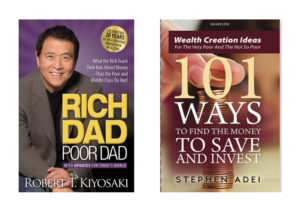 Which book has a better big idea: Rich Dad Poor Dad or 101 Ways to Find the Money to Save and Invest? Take a look at these two financial self-help books, for instance. Both books teach the principles of saving and investing money. But, can you guess which title sold more copies? Rich Dad Poor Dad is an international bestseller, yet 101 Ways to Find the Money to Save and Invest is mostly unknown. As we further explore the concept of the big idea, it will quickly become apparent that Rich Dad Poor Dad has a big idea behind it. This is because a title like Rich Dad Poor Dad stands out from all other books about saving and investing. The big idea behind this book has easily cut through the noise and captured any potential readers’ attention. Let’s delve deeper and explore how you can develop a big idea that works and leads to exponential growth in organic traffic: the ultimate goal for many businesses. How do you create your big idea for content marketing? At this stage, you may be wondering where creating your “big idea” fits in your inbound marketing strategy? The answer is it’s the crucial first step in your inbound and content marketing planning process. If you’re already part way through your content marketing strategy but don’t yet have a big idea in place, don’t panic: this is the time to audit your approach. How do they go from awareness to decision? 2. Next, you need to attract your target customer’s interest. One way to do this is to apply the concept of creating unfamiliarity into what they’re already familiar with, or vice versa. Here’s an example of introducing familiarity with what may seem unfamiliar to your audience: cryptocurrency. Most people have a sketchy understanding of what Bitcoin is. But if one were to explain Bitcoin as a form of “digital gold,” most people would be able to grasp that concept easily since ‘digital’ and ‘gold’ are things that people are already familiar with. An example of creating unfamiliarity into what people are familiar with would be the wildly successful product, Tangle Teezer, the de-tangling hairbrush. Everyone is familiar with a hairbrush. But a hairbrush that specializes in de-tangling your hair? That’s a novel idea! Tangle Teezer’s brand success started with a big idea, and inbound traffic grew organically. This product very effectively fulfills its promise to quickly and painlessly de-tangle hair, and customers promptly told their friends. Tangle Teezer became a self-promoting brand. As you move further through the process of finding your big idea, a memorable and straightforward method is to follow the acronym of B-I-G. Ask yourself: does your idea capture people’s attention? Talk about your big idea to your friends and colleagues. Are they interested? Do they want to find out more? Ask your colleagues and carefully watch their reaction. Is this an idea that you want to talk about with your friends? Also, consider if there are any market trends that you can leverage to create a content strategy around. 1. Genuine Incomparability. Your products are truly unique. Most of us, unfortunately, don’t fall into this category as this requires inventing a product with an exclusive patent. For most products and brands, the next two strategies are more realistic. 2. Industrial Incomparability. You create your big idea around something that your industry competitors may already be doing, but they don’t talk about it in their content strategy. Let’s take TOMS shoes as an example. For every pair of TOMS shoes sold, another pair is gifted to a person in need, and customers are made aware of their contribution. Customers feel good about their purchase, and TOMS stands out in a hugely competitive market. 3. Created Incomparability. This is the key to coming up with a big idea that works. You need to find something exciting and compelling about your product to help it stand apart from competitors. Imagine you work for a company selling health supplements for children, and you need to market vitamin D supplements. If you only list the benefits of vitamin D, most of your audiences will quickly lose attention — especially kids! To grow your organic inbound traffic and increase product awareness, you need to think differently about your product. Perhaps as you carry out some research on vitamin D, you discover that astronauts used it during space missions. Suddenly, vitamin D could potentially become the “Astronaut’s Vitamin”. Kids are fascinated by astronauts and intrigued by your product. And parents have the option to purchase an attractive health supplement that their children are excited to take. You’re not selling anything different, but you’ve found a creative way to make your product seem unique. And now we come to your Gargantuan Goal. Ask yourself one simple question: what is the biggest problem you’re trying to solve for your audience? It’s time to revisit your buyer persona and think about what triggered their customer journey. Let’s go back to the Tangle Teezer hairbrush. Its gargantuan goal is simply to provide a solution to the annoying problem of trying to de-tangle your hair. It solves its buyer persona’s biggest problem. Finally, let’s look at a brand that successfully demonstrates the B-I-G acronym in action: the painting tape brand, FrogTape. FrogTape’s content marketing focuses on its ability to achieve clean, sharp lines with no paint bleed. It creates the concept of PaintBlock Technology. PaintBlock Technology is buzzworthy — it immediately intrigues people. They want to find out more. FrogTape effectively inserts the unfamiliar into the familiar. FrogTape shares painting tips, how-tos, and inspiration as part of their content marketing. FrogTape also successfully harnesses “Created Incomparability”. It creates the idea of PaintBlock Technology to keep your paint lines straight and sharp. FrogTape’s “Gargantuan Goal” is to convince its customers to use FrogTape to create clean lines and avoid the worst-case-scenario of having to repaint a room. Every aspect of FrogTape’s content marketing strategy then links back to this big idea. Even the design trends on FrogTape’s website have subtle relevance to the big idea: their “Paint Block” technology. Get your big idea right, and you’re ready to soar. Your big idea is the beating heart of your product or brand. Every piece of content you create about your product has to link back to your big idea. It can be subtle, but it has to be there.